Even as the Congress president, Rahul Gandhi, last week in Dubai came on strong, and blasted the Narendra Modi regime for ‘four and half years of intolerance,’ and held out the prospect of a progressive and liberal India if his party came to power in the 2019 general elections, the heart of Indian politics, Uttar Pradesh, with 80 seats, has queered the pitch by entering into a new political alliance. 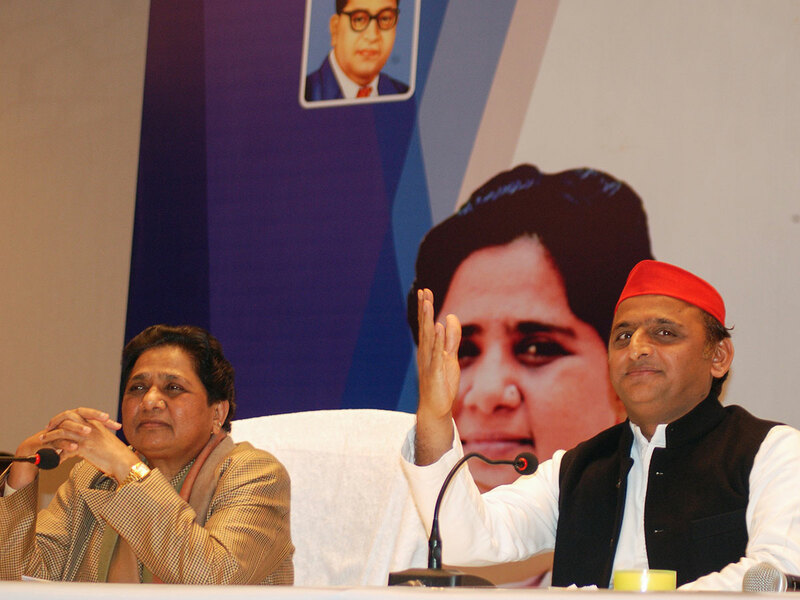 On Saturday, in Lucknow, the capital of Uttar Pradesh, the Samajwadi Party president (SP) chief, Akhilesh Yadav, and the Bahujan Samaj Party (BSP) leader, Mayawati, announced a political partnership that will contest 38 seats each. The SP primarily represents the powerful and propertied Yadavs and other forward castes in the state. The scheduled (‘lower’) castes form a little over 20 per cent of the population, and forms the base of BSP. Muslims, who figure nearly another 20 per cent, are another crucial vote bank, traditionally a resource of the Congress party. Reacting to the partnership rather pointedly announced in his absence, Gandhi welcomed the development. He said Yadav and Mayawati had every right to form an alliance. He did not see it as a threat to the political prospects of the Congress Party in the state, though in the 2014 elections the party won only two seats. Gandhi may be truly feeling at ease with the prospect of the new alliance. If only because the consolidation of the caste based votes will keep the BJP from getting a look in. The Uttar Pradesh state government is currently led by a hard-right Hindutva strongman, Yogi Adityanath, who has so far proven inept in administrative matters. Though politically a very important state, UP sorely lags in all development indices. Adityanath has alienated the Muslim population by his brand of politics. And since he is unapologetic about his saffron agenda, the lower castes too do not see eye-to-eye with him. Make no mistake. These are words of expediency. In the mid-90s Mayawati had formed a government in the state with the support of the BJP — but not before trying her luck with SP and the Congress. The new alliance’s main grouse against the Congress has been that that a political understanding with that party does not help them to get new votes if the past is anything to go by. Essentially that means the party’s base and cadre do not trust BSP. The BSP and SP may have hit it off for the moment to offer a united front to divide the spoils with the Congress in the near future. Or to bargain with the Congress at the right time, which is round the corner. If the Muslim population in the state finds faith in the leadership of a resurgent Rahul Gandhi, the fortunes in Indian parliament will change. Gandhi’s speech in Dubai and else where in the Middle East repeatedly stressed on the liberal ‘idea of India.’ If nothing but a sound, it still holds hope for the minorities and the under privileged. As already said, the last is the core constituency of the BSP. Which perhaps explains the pre-emptive haste of Mayawati’s new found friendship with Yadav. The BJP is aware that the odds are stacking up against them. On the same day when Mayawati and Yadav announced their new found love for each other — years ago, both parties had come literally to blows — at a BJP convention, in Delhi, Modi more or less said he would be in the running as Prime Minister for a second term. That the BJP will field Modi as their PM candidate seems pretty much set and certain. But when a magician has run out of most of his tricks, it is not likely that the same audience will come back for his next show. If Mayawati or Yadav garners around even 50 per cent of the 78 seats they are contesting, they will be a great, determining force in Parliament. And if that happens, Mayawati — who has professed to such ambitions — may have an outside chance of becoming the PM of a motley alliance. It is possible. But as this writer has mentioned in these columns before, no matter who comes to power in the coming general elections, no leader is talking about hard economic decisions he or she will need to take. After trying out just about every political experiment permissible in a democracy, Indian political parties are still coming together or breaking apart in terms of castes and religion. It is perhaps a pointer to how little Indian society and politics have moved from its set ways. The more things change, the more things remain the same.